These four cancer-fighting spices have powerful health benefits and were part of my daily regimen to heal cancer without chemo. They are common, but not commonly found in American cuisine, so I had to be very deliberate about adding them to my food. I took copious amounts of these four spices and still do today. They are (organically grown): Oregano, Garlic, Cayenne Pepper, and Turmeric. Indians eat a mostly plant-based diet, have some of highest spice consumption in the world, and significantly lower cancer rates than Americans. They have five times less breast cancer, ten times less colorectal cancer, and twelve times less lung cancer on average. Turmeric is the business because it contains the powerful cancer-fighting polyphenol Curcumin. Curcumin has the ability to block every stage of cancer development, from cell mutation, to tumor growth, to metastasis. It can also kill many different types of cancer cells by triggering apoptosis (programmed cell death) without affecting normal cells. It is because of these known benefits, that curcumin has been the subject of cancer research for many decades. There are hundreds of published studies demonstrating the anti-cancer power of curcumin, but because the pharmaceutical industry hasn’t figured out how to make a patentable FDA-approved drug out of it, curcumin cannot be used in cancer treatment. This is the reality of “evidence-based medicine”, ignoring all evidence that cannot produce patented profitable drugs. 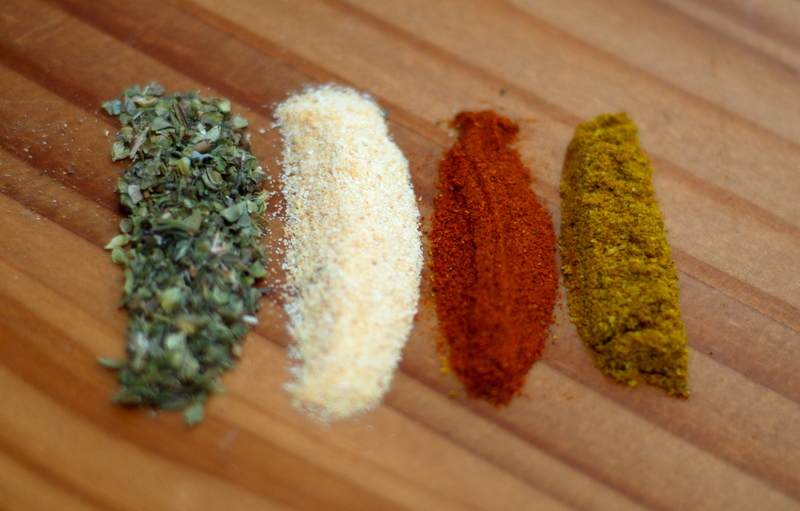 Curry Powder (shown above) is a common ingredient in indian and asian cuisine, is typically a mixture of coriander, turmeric, cumin, fenugreek, and red pepper. I love turmeric and curry powder and I put it on everything. Any time you put turmeric on a dish make sure to add a little black pepper, it increases your body’s absorption of turmeric by about 2000%. Love the stuff. It’s delicious! Oregano has extremely high levels of antioxidants and antimicrobial compounds. It is a powerful parasite fighter. One teaspoon of oregano has the same antioxidant power (ORAC) of two cups of red grapes. It contains the phytochemical Quercetin, which is known to slow cancer growth and also promote apoptosis (there’s that word again). And on top of that Oregano is a good source of Vitamin K and Iron. Garlic is the most powerful anti-cancer spice. Studies all over the world have shown it to lower the risk of developing all types of cancers especially colon, stomach, intestinal, and prostate cancer. It has strong antibacterial properties as well as the ability to block formation and halt activation of cancer-causing substances. It can also enhance DNA repair, slow down cell reproduction, and like Turmeric and Oregano, induce apoptosis. It stops cancer growth and kills cancer cells. Cayenne Pepper contains Capsaicin, which is the active compound that sets your lips, tongue, and everything else on fire. Turns out Capsaicin is also the stuff kills cancer cells, causing…can you guess it?